A study published this week reveals the extent of alcohol advertising partnerships with AFL and NRL teams this season. It shows that alcohol advertising deals are widespread in these sports. However, alcohol advertising deals are not a prerequisite for sporting success. In the AFL, the Western Bulldogs won the 2016 premiership and have no commercial partnerships with alcohol companies. The worst offender in the AFL, the Geelong Cats, has three major and one minor alcohol advertising deals. North Queensland Cowboys accepts the most alcohol money in the NRL, and alongside New Zealand Warriors and Brisbane Broncos, has alcohol-branded playing kit, training kit or merchandise. This study builds on previous research which found almost one occurrence of alcohol marketing per minute in the AFL, and over three per minute in the NRL 2018 grand finals, both broadcast during children’s viewing hours. These studies combined demonstrate that the AFL and NRL are currently used as a highly effective conduit for mass alcohol marketing during children’s TV viewing hours. Children should be prevented from consuming alcohol because it can damage the developing brain, causes cancer, and is a psychoactive, addictive drug that contributes to the three leading causes of death among adolescents – unintentional injuries, homicide and suicide. Young people’s exposure to alcohol marketing increases their alcohol consumption and increases their likelihood to start drinking earlier. In addition to children and young people associating sport with alcohol, research has identified that alcohol marketing in sport is linked to increased alcohol consumption, including among school children and those who are playing the sport. In Australia, it is currently possible to advertise alcohol during children’s TV viewing hours and to sell alcohol-branded children’s clothes. Sport, which should be a positive and healthy thing for children, is the main route by which this happens. This is made possible in Australia due to an exemption in the Commercial Television Industry Code of Practice that allows alcohol advertising during children’s viewing hours if it is an accompaniment to a live sport broadcast or sport program. 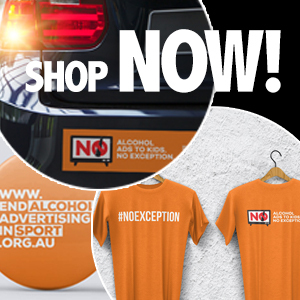 The exemption is heavily exploited by the alcohol industry, with 49.5 per cent of all alcohol advertising shown during the broadcast of live sporting events. This week’s study reveals that alcohol multinationals are the main companies that exploit these rules to drive sales growth. A small group of some of the world’s largest alcohol companies are responsible for the majority of alcohol advertising deals in the AFL, AFLW and NRL. Just four companies are responsible for the majority (60 per cent) of the instances of commercial partnerships between alcohol brands and clubs (43 of 72 total). All of these four companies are owned by foreign interests: Carlton and United Breweries (also known as ABI Australia Holding Pty Ltd) is owned by Anheuser-Busch InBev (Belgium); Diageo Australia Ltd is owned by Diageo plc (UK); Asahi Holdings (Australia) Pty Ltd is owned by Asahi Group Holdings Ltd (Japan); and Lion Pty Ltd is owned by Kirin Holdings Company Ltd (Japan). Ireland recently introduced the Public Health (Alcohol) Act 2018 which prohibits alcohol advertising during sports events, prohibits the manufacture or sale of children’s clothing which promotes alcohol products or the consumption of alcohol, and prohibits alcohol advertising on TV between the hours of 3am and 9pm. In Australia we don’t even have to change the law to start righting this wrong; we can start by ending the exemption that permits alcohol advertising during children’s TV viewing hours if it is linked to a sport program. Join the growing movement of people saying no to alcohol ads to kids – no exception. Around 830 Aussie women get alcohol-related breast cancer every year. That’s 46 AFL teams. Of these women roughly 144 will die. That’s the equivalent of every woman in the AFL Women’s inaugural season. Wolf Blass exploit the AFLW league to advertise this deadly product to more women and girls. That inaugural season was profound for many reasons, not least in the way it has inspired young girls to take up AFL. Tragically, this advertising partnership is also inspiring young girls to take up alcohol consumption. Make no mistake, the alcohol industry targets culturally significant moments like the professionalisation of women’s AFL to normalise alcohol consumption and obscure the fact that alcohol causes cancer. Another study published this week shows that for women, drinking one bottle of wine a week is the equivalent in cancer risk to smoking ten cigarettes. For men, a bottle of wine is equivalent to five cigarettes, with gender differences driven by the fact that alcohol causes breast cancer. The researchers concluded that “moderate levels of drinking are an important public health risk for women”. Would you support your team to advertise cigarettes to children? Nobody trusts the alcohol industry to regulate themselves; our sporting codes and teams must take the initiative. Congrats to the Western Bulldogs men’s team for leading the way. If you’re living in Victoria and aged 18-29 years, you can take part in the Top Spin competition to call out the advertising tactics of alcohol companies.